No matter how much romantic mumbo-jumbo about "technology" and "man-machine interfacing" you stuff into the basket of video game history, one simple fact remains: These things were designed to make money. Above and beyond everything else, these boxes were out there to attract young minds and addle them with enough flash to make them drop perfectly good currency into a slot that, if working properly, would never return anything again. You could spend hours and hours mastering the program inside, and all you might show for it would be blurred vision and hands curled like the last grip of a corpse. Meanwhile, the game would just return to "attract mode" and await the next sucker. While there is absolutely no way to discount the amount of artistry and effort that has gone into video games over the years, the out-on-the-street nature of this art means that a more cynical, realistic mirror-world existed for the machines in their day-to-day actual usage. The most beautifully crafted control panel was no match for the cigarette burns and beer of a run-down bar, and woe be to a Tempest game that found itself down at Mario's Pizza Parlor for a four-month stretch. 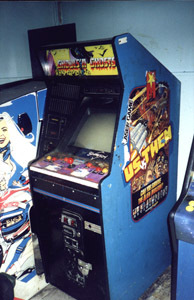 Video games are rarely bought outright by arcades and stores; they are usually purchased by syndicates of vending machine companies that lease space or rent out machines for spans of time. Since these companies subsist on the machines alone, they are absolutely brutal about keeping a machine up and functioning at all cost. 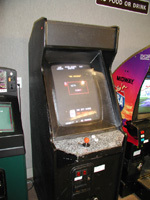 If a game is no longer selling, and a conversion kit or spare parts can turn that game into a newer product, no amount of love of the side art, control panel, backscreen or marquee will prevent the owner from stripping the case like an old Ford and turning it into an approximation of the Hot New Thing. This particular art, done out of necessity and battling the endless youths who will pummel the machines into submission, is where this page comes in. I am collecting pictures of machines that have experienced particularly breathtaking transformation at the hands of owners and renters, and have been turned into beasts most likely unseen elsewhere in the world. These are truly the rarest games. 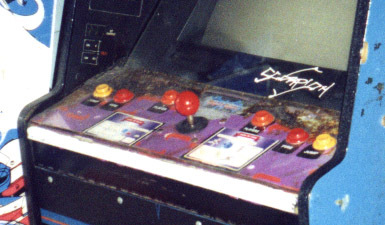 Most amazing of all is the scorched-earth decoration of the control panel; this says "Murray's Pub" all over it, coupled with images of late-night drunken attempts to master some game requiring much more hand-eye coordination than four glasses of beer would normally allow. If this game was up for sale, it would consider itself lucky to fetch a double-digit price. While there is no doubt a market in Mah Jongg video games that has completely slipped by my radar in the past few years, I am skeptical that it has been created by anything other than the companies that have produced clones of more popular video games. This case is most obviously a rough conversion, and I have to point out that any game that requires THAT AMOUNT OF BUTTONS is not exactly the best use of spare parts. Who can begin to guess what other machines all these buttons used to be in. At the very least, this game will provide tons of spare parts for other machines once it goes out of commission. Is there really a market for Mah Jongg video games? Everything about this machine says no. 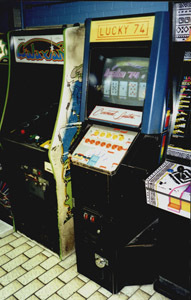 "Lucky 74" was stuck along a Toronto arcade, somewhere towards the middle, which means that it wasn't the least profitable game in the place. Attempts to wrestle the poor thing out from the clench of the games around it were unsuccessful, so the full entymology cannot be determined. 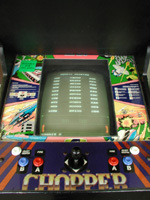 Most likely, this was some type of Atari game, such as a 720o or Major Havoc. 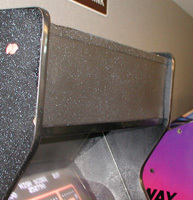 (Atari was really good at making one-time-use cabinets that didn't conform to any actual standard.) Lucky 74 itself is some sort of card game, although why anyone would want to play a video card game without monetary/ticket payoff is beyond me. 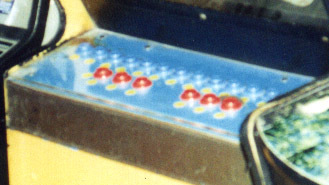 If this is an Atari game, that very likely means that the control panel used to have a joystick or flight yoke which was ripped out and replaced by the buttons. Oh, I went back to this arcade later; this machine was an Atari Return of the Jedi machine in a previous life; Darth Vader and an ewok are clearly visible from the side. As a bonus, note the Galaxian to the left, which appears to have experienced some sort of unhappy occasion with fire. 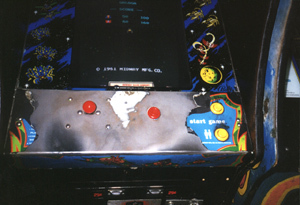 The singe marks go all the way to the back of the machine. 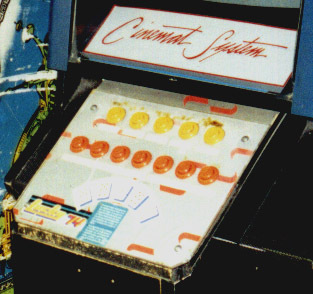 One can always expect a little bit of wearing on the control panel of a popular video game, but I'm at a loss as to what set of circumstances would cause the amount of wear and tear on this Galaga to the point that 95 percent of any paint, markings, or even undercoat remains. What's more, the bare metal is shiny. Could some misguided owner have decided that taking a brillo to the machine was the only solution to make it look presentable? 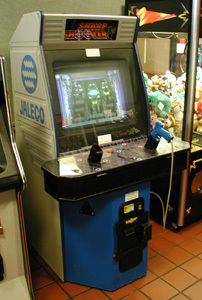 Regardless of how it came to be, this Hampton, NH-located arcade game went through something very bad, very involved, and very long-lasting. 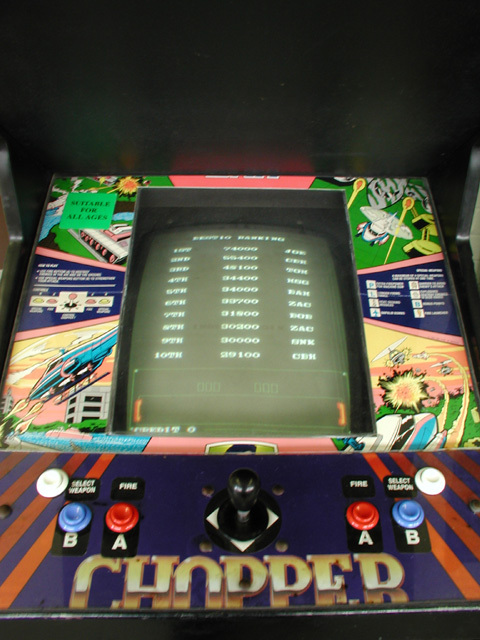 However, the game itself is untouched by the forces that touched the rest of the machine, so you can play it quite nicely, and everything's responsive just like you would expect it to be. The second picture shows that the "New-Way Sales Company" is so proud of their name and reputation, that they'll gladly block out part of the actual screen of the video game to put their name where anyone playing can see it. Now THAT's a public relations effort! Whoever chooses to play this game of Sharp Shooter on the left side will find themselves at a complete disadvantage. On the positive side, it looks like the break was a clean one, so replacing the pistol won't be a problem the next time the video game guy comes to collect the money. On the other hand, since the game is actually quasi-functional with just one gun left, this game could stay this way for years and people, like myself, will just look sadly at the missing part and then get back into our cars and drive far, far away. Everything about this machine, by the way, says "I can be converted into something else in under an hour." 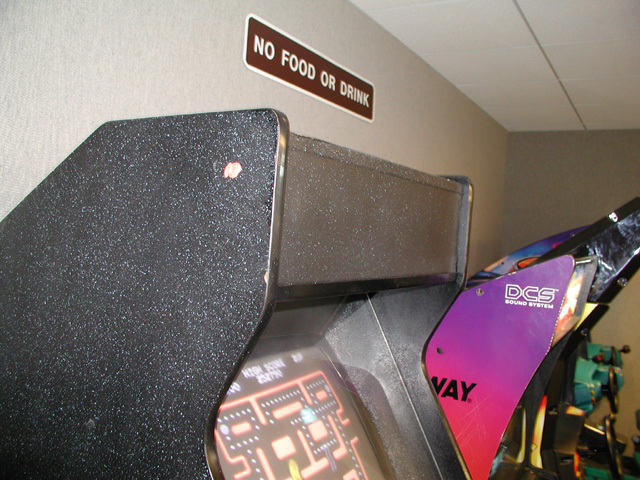 Sometimes, you have to make your Pac-Man conversion completely invisible to the naked eye and any sort of enemy radar. The solution is simple: make every single inch of this machine jet black and put it somewhere in a rest stop in NY (I should mention it was a very nice rest stop). This particular Pac-Man machine was not just a regular old Namco original, it was a new strain I've just become aware of called two-bit Pac-Man which is created by a texas company called "Two Bit Score". This is actually rather impressive; the creators of this ROM have packed at least thirty-two variations of Pac-man and Pac-man bootlegs onto one chip! 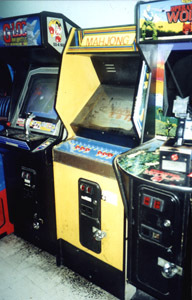 When you put your quarter in, you get to choose which of the games you want to play. I was very impressed with how well it was done. Excellent show! Now if I can only find the machine again! Where's my infrared? Sometimes, you don't have exactly the right shape for the game you want to convert to, but it comes so close. 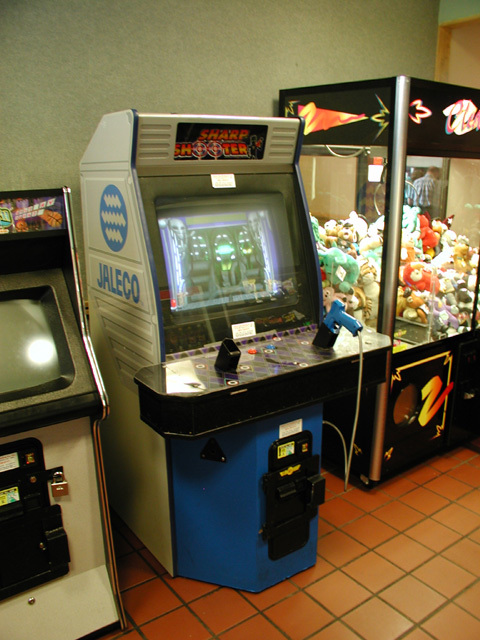 Whoever decided that the SNK game Chopper had to get out to this NY Rest Stop apparently had no problem forcing the poor bezel art into a slightly smaller space. As a result, Chopper is "Chopped". Maybe I'm just being sentimental, but I'm touched that whoever did the conversion work on this game of Sega Rally covered up the now-inaccurate directions for the previous game with a collection of clip-outs of car and car-part logos. You can see Volkswagen, BMW, Goodyear... An A for effort!